Does your organization have an outsourcing plan? Outsourcing, now being a business necessity, requires proper planning and execution. Devising a proper outsourcing plan before you hire an offshore service provider from India is critical to the success of the outsourcing project. If outsourcing is well planned, it can reduce half of your current operating cost and add great value to your business. Here are a few guidelines to help your company come up with the right outsourcing plan before you invest in IT outsourcing or software development. You must have specific reasons why you want to outsource a particular service to India. 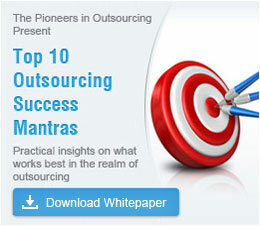 Write down the objectives and the outcome that you expect from outsourcing. Select an Indian service provider only when you have clearly defined objectives and targets. Decide on the back–end work that you want to outsource to India. To begin with, try outsourcing non–core business functions that can bring your organization great savings. By starting with easy outsourcing requirements and then moving on to a complicated outsourcing project, your offshore vendor will be better acquainted with your project scope. You also will find it easier to manage the flow of the outsourced project. While devising your outsourcing plan, remember that an outsourcing requirement that does not require expert technical knowledge will result in a failure proof outcome. While hunting for the perfect Indian service provider, check on the provider's background. Apart from their experience, also check on work ethics, work culture and cultural compatibility. Do not forget to also check on references. All this verification will help you work better with the Indian vendor in the long run. Choose an Indian outsourcing location which offers you the best resources, good facilities and low labor cost. Pay a visit to India to meet your offshore vendor and interact with the team who would be working on the outsourced project. While working with an Indian service provider for the very first time, remember to start by outsourcing small requirements. Once you are happy with the results, gradually move on to the next level of outsourcing a more complex project. When you are completely satisfied with your Indian service provider, you can increase and expand the project scope. You can move on to more complicated requirements. Once you are sure about your offshore vendor’s requirements, do not hesitate to expand your business requirements to the fullest. When you decide on outsourcing to India, your employees may begin to feel insecure. Explain to your employees that outsourcing to India is only one of your company’s many business requirements. Make your employees feel assured and secure while outsourcing to India. Prepare your organization’s management for changes that might happen by outsourcing to India. Inform your management staff about your long–term plans and business development strategies. Provide your management with training to deal with employee retention. Make your Indian service provider comfortable, by making them a part of your company. This will encourage your offshore development team to be dedicated to you. It will also result in a good business relationship between you and your offshore vendor. Make all your business processes secure, before you give the offshore vendor access to important company details. Upgrade and secure confidential networks and client details. To keep business critical information safe, ask your offshore vendor to sign a Non Disclosure Agreement before starting on the outsourcing project. Outsourcing to India cannot bring in great results overnight, so it is important to have realistic expectations. Outsourcing will result in more savings, but that would take some time. Remember to also give your outsourcing project time, before you begin to see great results. Outsourcing to India can help you cut down on cost, improve efficiency, experience better quality and do away with management headaches. Remember to devise an outsourcing plan before outsourcing to India. Make a decision to outsource to India today.